In its apex in 2012, NOM and NOM-Ed reported combined revenues of $16 million. The 2017 economic reality was far different. 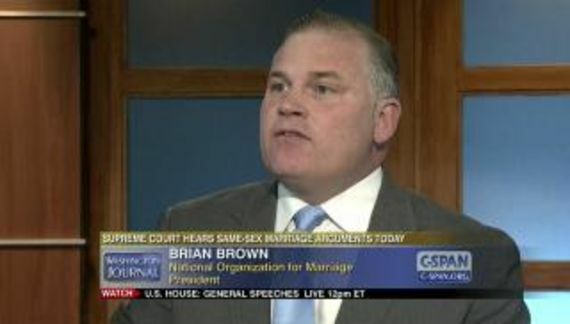 A maniacal Brian S. Brown, president of National Organization for Marriage. In its annual report to the IRS, National Organization for Marriage has reported 2017 revenues of $525 thousand. For 2016 the anti-LGBT group had reported nearly three times that amount ($1.5 million). Similarly NOM Education Fund's revenues declined from $1.4 million to $930 thousand. Brian S. Brown did not receive a salary (the prior year he received $183,750). During the year, NOM only received one contribution of $5,000 or more (it was $50,000). NOM-Ed received eight contributions at, or above, $5,000. One was for $850,000. At least $500,000 of that made its way back to NOM. $250,000 for shared expenses and another $250,000 as a loan. Contributions to NOM are not tax deductible. Contributions to NOM-Ed are tax deductible so once again, NOM-Ed served as a conduit to provide tax-deducted funds to an ineligible entity — NOM. Oddly enough, NOM extended a loan to Brown's other gig (Howard Center AKA World Congress of Families AKA International Organization for the Family). At year's end the remaining balance was $58,164. Through the year, NOM had only two employees. However it shows 28 independent contractors. One of those might be Brian S. Brown. During 2016 NOM had 16 employees plus 28 independent contractors. Is it a coincidence that they reported the same number of independent contractors year-to-year? It is impossible for me to know. NOM's two employees received $250,000 yet neither is shown as a highest compensated employee (employees who received more than $100,000). That is a mathematical impossibility. At least one of those people received more than $100,000. Based on total compensation and the number of employees receiving a W-2, NOM slashed its payroll in early 2016. I am guessing that Brian S. Brown has a lucrative arrangement with the European funders of the World Congress of Families events (“congresses”). In the past he has also received money from another venture, ActRight.